Current professional philosophy is “deflationary” in that it gives no answers to our larger questions, in particular our questions concerning our selves, our projects, our questions concerning our own selves, our projects, our place in society and in the world. We have lost a vast resource of cultural meaning upon which we could draw to construct meaning for our lives. Meaning, in this large sense, can no longer be drawn unproblematic from religion. We have information, but not knowledge. We all strive to have a “theory” or narrative about our selves., we want to have a meaningful story about our lives that affirms our humanity. In short, we want them to mean something. The complex systems under which we live (economic, technological, global) have put the self”under siege”, overloaded with information and images that offer no meaning for us. We have difficulty making any sense out of our lives. Marx, Freud, and Nietzsche (the figures named the “masters of suspicion” by the French Philosopher Paul Ricoeur) developed powerful criticisms of out cultural mechanisms of meaning in particular religious meaning. Taken together, they raise the problem of “false consciousness”, the suspicion that our certainties and our beliefs are the products of hidden economic, psychological, and cultural motives. The reflect and respond to the vast changes in out views of what it means to be human that come along with modernity and the economic and cultural system of capitalism. Marx exposes religion as a mask for vested economic interests, Freud shows its origins in infantile distress and fear, and Nietzsche raises the suspicion that it is a mechanism of power and deceit. After them, no simple faith is possible. They are the common possessions of our culture and their critiques belong to us. We have no choice except to engage them either consciously or unconsciously. They are the gate through which any relevant modern view of the self must pass. Thus, they mark the beginning of these considerations of the self under siege. Heidegger developers a powerful account of meaning by recasting traditional talk of the self and the human into an analysis of “Dasein”, literally “being there”. He hopes to discard much of the baggage of the philosophical past in a kind of “deconstruction” that has, and continues to be, very influential with thinkers as diverse as Derrida, Macuse, and Sartre. We should not let Heidegger’s infamous connect to fascism blind us to his real insights. It is sad, but true, that even very bad people may have important things to teach us. Heidegger does not begin with a “method”. He begins by beginning. He offers a hermeneutic of Dasein, or the historical and cultural self. A hermeneutic is a narrative, a story , whose humans are always already interpreting beings and, from this, the analysis of Dasein can begin. In “Being and Time”, Heidegger is guided by the distinction between Being and being. The only priority of human being or Dasein is that we are the beings that ask the question concerning the meaning of Being (what does it all mean?). He is no “humanist”, rather it is Being that draws his concern toward Dasein which he proceeds to analyze across the dimension of time. Humans relate to the past by being “thrown” into a world. This means we are socialized and have a language and a view of the self already. Thus, it is impossible to begin without a structure of prejudices as built into our culture and our history. Humans relate to the present as “being at home in or not being at home in”. This means that we try to find a satisfying place view of ourselves and out world. Humans relate to the future as “being ahead or ourselves” or “on the way to”. This means that we formulate projects and make plans. The fundamental structure thus revealed is that humans are beings who care, who have concern. This can be seen in what they build and do even more than in what they say or think. Anxiety before death is the fundamental human mood, since death is the end or our projects and our concern. For Heidegger, authentic existence must not “flee from” this insight into the unthinking mass of people (the “they”), but rather use this insight to give meaning and purpose to our projects. Such projects are “free for” and “free from” the stifling yoke of conformity to “the they” or what other people think. Against Heidegger’s powerful account of being human it can certainly be argued that “authenticity” is too abstract as a means to measure our projects. One can be an authentic Nazi , for example, just as well as an authentic Christian. Heidegger gives us absolutely no grounds for choosing one over the other. Authenticity will be important in our account of the self, as will care and concern with a project, but it will not be enough to save the self under siege as the case of Heidegger himself makes clear. Sartre is a paradigmatic 20th Century intellectual: philosopher, artist, critic and political activist. For an American audience, however, he is known first and foremost as an existentialist. His novel "Nausea" and his philosophical treatise "Being and Nothingness" are the best examples of this period in his development. Sartre’s existentialism was based, in part, on a misreading of Heidegger as a humanist; but this misreading lead to his own interesting existential humanism. The first principle of his position is an absolute atheism. God does not make us, we make ourselves. Sartre’s way of expressing this is that our existence precedes our essence. Without God, humans are "condemned" to be free. Sartre sees our refusal to recognize our radical freedom as "bad faith"; a condition in which we treat ourselves as determined objects rather than as free subjects. Sartre’s existential ethic requires us to ask of our actions; would others act as we act? Our decision must be made in the light of our humanity, but also with full autonomy. Sartre recognizes that without God some limits to our freedom remain such as the brute objectivity of nature and the behavior of other people. These limits are seen as negative. In his play "No Exit", Sartre goes so far as to say that "Hell is other people". Sartre comes to modify and, in part abandon his earlier existentialism in favor of his own development of Marxism. In a sense, he tries to fuse his earlier emphasis on the singular individual and his growing concern with the fused collectivity, the group seeking to change its condition. In "Search for a Method" , Sartre uses a discussion of Kierkegaard as a representative of the individual and Hegel as a representative of the collective to express his desire to bring the two interests together in a future philosophy of freedom that, for him, only a revolution can make possible. Sartre experienced both fascism and the liberation of the 60’s; his philosophy always reflected a profound engagement with hiss own time. Perhaps he is not a great philosopher, hut he is exemplary in his attempt to become a human being in the 20th Century under the most difficult conditions. Sartre’s account of "bad faith" and his basic honesty in the face of the human historical condition will serve to guide us in our account of the self and its predicament in the late 20th Century. Marcuse became a pop figure, the philosopher of the 60s. He expressed a key contradiction in modernity. Modernity is "enlightenment", the end of myth and dogma, the power of reason; but it is also the rise of technology, capitalism, specialization, instrumental reason and the return of myth and dogma. The enlightenment built an intellect powerful enough to surrendering dogmatically before the powers of technology. This is the "Dialectic of Enlightenment" as analyzed by Herxheimer and Adorno and popularized by Marcuse. Instrumental rationality, information-based individual reason, leads to irrational outcomes. Individual monologic rationality is not rational in the totality of overall system. How did the force of the love of reason become itself unreasonable? The self cannot escape siege under the sway of instrumental reason alone, it drains the world of meaning and leads to the entwinement of myth and enlightenment. The film "Dr. Strangelove" is one long example of the contradictions outlined by Marcuse. Instrumental reason is the product of a one-dimensional society that produces one-dimensional human beings. Marcuse criticizes our society along at least two dimensions. First, the inner dimension: anxiety, despair, nausea and a massive industry in drugs to deal with these pathologies. A society of addicts. Second, the outer social world: alienation (separation from the subject and the object and the self in Marx’s sense); rationalization (bureaucracy and technical action in Weber’s sense). These produce a one-dimensional culture or banality which reduces human suffering and human desire to trivia and image. Such humans have by now become deeply skeptical and cynical about almost everything; in particular, the government and the culture industry. Beyond that, we are becoming skeptical about our history, our meaning, our purpose and the general fate of the species. Marcuse’s method of criticism is called internal critique which measures a society against its own historically accumulated concepts and ideals in order to point out the gap between the actual social practices and the principles. Marcuse also never lost faith in the human species to reconstruct itself, to begin anew. This hope of liberation transcended the field of economics and standard Marxism, as well as the achievements of the so-called free and democratic world of today. He also rested his hope in the possibility of that the self could be won against the odds. Today, unfortunately, this view will seem to many quaint. Habermas is perhaps the last important defender of a kind of rationalism that attempts to save the contributions of modernity, while recognizing its distortions and pathologies. He will attempt to disentangle enlightenment in myth in the name of human emancipation free from unnecessary constraints. Habermas begins his project with a distinction between labor (as analyzed by Marx) and interaction. The first is based on production, the second on communication. The first is monological, the second dialogical. Freud serves as the model for the study of distorted forms of speech and action upon which a critical theory of society can take its start. But to criticize distorted communication, a model of undistorted communication is required. Habermas seeks to develop an argument that the human species has a fundamental interest in undistorted communication that is built into the very structure of language. Undistorted communication must meet four conditions; the symmetry condition (everyone has an equal chance to talk and listen); the sincerity condition (everyone discloses what they believe to be true); the normative condition (everyone attempts to say what is right morally). Such communication would make a free society possible in which the only force a free person must recognize is "the unforced force of the better argument". This is not just an elitist notion, since "in a process of enlightenment there can only be participants". Undistorted speech and action opens us up to the concept of communicative rationality that acts as a counter concept to merely instrumental rationality as criticized by Marcuse. For Habermas, we should seek a balance between instrumental and critical reason, between science and the ethical and the aesthetic dimensions that have been unbalanced by power and money, state and economy. The fragile self is caught between these abstract systems of control in its struggle for autonomy and meaning. Habermas’ project for emancipation holds out the hope that a measure of the dignity of humanity can be rescued from the one-sided development of modernity through the power of solidarity and reason. Haberma’s project is ongoing and includes activity in the public sphere where alone the promise of a reasoned consensus based on undistorted communication might be fulfilled. Foucault is a strong anti-humanist who believes that "man" is a relatively recent construction of a particular historical paradigm. Such paradigms structure discourse and action, as well as institutions and belief systems. They are, at the same time, systems of knowledge that are always interconnected with systems of power. Anywhere you find knowledge, there too you find a regime of power. Knowledge is comprised of discourses that function through rules of exclusion. These determine who may speak, about what, for how long, and in what setting or contexts. Foucault’s "Discipline and Punish" shows how the paradigm of punishment and the law shift from one period to another. In the feudal period, we have "the body of the condemned" as a singular figure and "the spectacle of the scaffold" which expresses the criminal as a transgressor and our interest in him. In the modern period, we move to a paradigm of generalized punishment; from the body of the condemned to the entire social body (public works, school and prison reform). The reformers in many areas institute a micro-physics of power over the "docile bodies: of the "trained" and "socialized". specificity, take single instances to illuminate larger points. Foucault wants to reclaim a kind of radical critique in the interest of people rendered inhuman by what he sees as the very discourse of the "human". Foucault can be read as a novelist, a historian, a radical critic of society, and many other things. Most importantly, he has changed our discourse from Marx and the "factory" to Foucault and the "prison". He has carried forward at least a part of the task of freeing a new kind of self from the barbarism of what is still called the past. Richard Rorty may be viewed as an "Americanization" of Derrida: widely considered the postmodern thinkers (perhaps wrongly). Here we will use Rorty as a guide to Derrida. Derrida’s emphasis is on fallibility, contingency, finitude; positions partially demonized as relativism, deconstruction, and vaguely connected to radical politics, multi-culturalism, and so on. "Deconstruction" originates in Heidegger’s project of the deconstruction of metaphysics, an "uncovering" of the history of Being. Derrida notes, as he proceeds through a series of techniques of deconstruction as reading/misreadings of texts, that philosophers have always tried to fill in the blank in "Being is __________”. But they have failed due to the nature of language which is constituted by difference, materiality of marks and phonetic signs, marginality, materiality. Words do not stand for things, they stand in for them. Meanings depend not only on presence but also on absence. Words can always misrefer; a possibility once is a necessity forever. The upshot is that there are no final interpretations, no last books. Better and worse readings depend on context and purpose. Meaning is not fixed "humanly" (against "humanism"). Philosophy has always already thought the end of man in thinking the truth of man. For Derrida, "man" is implicated in the "white mythology" that is philosophy and whose time is rapidly passing. This leaves the "self". the "I", as no more than a vanishing positionality in a text. And this is a long way from the kind of story that might provide us with meaning for our own lives. Finally, when reading Derrida, remember, he may just be joking. If he is right, even in part, the same might be said for Plato. The task of creating a life with the "self under siege" to the degree I have argued may seem impossible. At the very least, it calls for what Baudrillard calls "fatal strategies". So I begin this lecture with the work of Baudrillard, perhaps the last philosopher? Baudrillard builds on the work Guy Debord, the situationist author of "The Society of the Spectacle". Baudrillard traces the symptoms and tendencies of the trajectory of the postmodern; a set of concepts appropriate for a new world of technologies of images and communication developing in the late 20th Century. The first of these is the Hyperreal. This is the image, the reproduction that is more real than real, reality is whatever can be mechanically and technologically reproduced. This is made possible by the shift from hard to soft technologies. The second of these is Simulations. Reality is that which can be simulated, xeroxed, virtual reality, images, data flows, information at rapid speed. The third of these is Utopia Realized as the End of Man and World, with all their references to the regulation and control and obvious political meanings. Baudrillard ironically argues that America is Utopia realized in “the shadow of the silent majorities” and with all the banality that belongs to all Utopias. For Baudrillard, we are, or are becoming, fractal selves; split, reproducible, basic life-style changes as fads, the disappearance of experience and the desire for a vanishing reality. Beyond Baudrillard, Afrocentrism appears as an answer to reconnecting ourselves with "reality". But this too is becoming commodified in rap and "black" films. The Ecstasy of communication, the vertigo of information overload, the banality of a Transparent society; can any of these postmodern symptoms show us the way out of the 20th Century and toward a new construction of the human? Can we find meaning in the "world" that is already upon us? It is our task to try. Derrida, Jacques, “The Margins of Philosophy”, University of Chicago Press, Chicago. 1982. Foucault, Michel, “Discipline and Punish”, Vintage Books, New York. 1979. Heidegger, Martin, “Basic Writings”, Harper & Row, New York, 1977. Ricoeur, Paul, "The Philosophy of Paul Ricoeur", Beacon Press, Boston, 1978. Sartre, Jean-Paul, "Search for a Method", Vintage Books, New York, 1963. The link to lecture #5 on Habermas is incorrect – it comes back here. Please fix. Thank you very much for this website. I have to say, the recordings of these lectures (and all the other ones I have found) show how brilliant a lecturer and communicator Rick Roderick was. I wish I could have had the privilege to have spent time conversing with him. I actually recently acquired a copy if his book on Habermas.. Do you know if there are any more of his writings still existing? I recently discovered that Rick Roderick’s article ‘Reading Derrida Politically (Contra Rorty)’ has been made available online! I’m very excited as I’ve been looking for it for years. If only I could’ve got it when I was trying to write an essay on Derrida in college though. When I click on lecture one it keeps bringing me back here. To get the paper from the CEEOL link I had to create an account, and to save others the trouble, and spread good information, I have uploaded the doc to my google drive, see above. Roderick, in his paper “Reading Derrida Politically” provides I think, the only legitimate and example of how a postmodern schema can defeat a rational one, without using rationality to do it’s bidding. Roderick’s argument cannot be argued against using rational or analytical methods. Cleverly, Roderick does not actually argue argue against rational discourse or method, but he points to the place where the argument would take place. 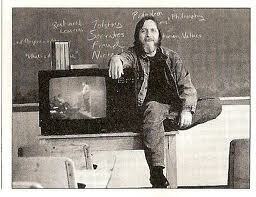 The ideas of Rick Roderick are essentially dangerous, as he is not an intellectual impostuer (the name given by analytical philosophers to postmodern theorists), but a true philosopher, as on realizing the flaws in analytical philosophy, he had no fear, nor hesitation to point them out in an utterly coherent and inarguable fashion.